Did you know that every year between 25 and 60 million bottles worth of sunscreen washes off of our bodies and into the ocean? Did you know that ingredients like oxybenzone, butylparaban, octinoxate, and 4MBC, which are found in many different brands of sunscreen are highly toxic to coral reefs, and recent research is finding that these ingredients might also be harmful to us? We are in the thick of summertime and this is when we tend to lather up with the most sunscreen. Protecting your skin from the sun is crucial, however you can do it without harming our reefs and potentially harming yourself. Fortunately, we live in an era of choices. There are two main types of sunscreen, physical and chemical. Chemical sunscreens absorb the harmful UV rays from the sun, while physical sunscreens deflect and block the UV rays from our skin. Physical sunscreens contain the active ingredient zinc oxide and or titanium dioxide. Physical sunscreen, or mineral sunscreen, are all natural and as far as we know pose no threat to the coral reefs and marine ecosystems or our own bodies and health. At Parker Dentistry Facial Rejuvenation and Wellness, we believe in carrying the highest quality, safest, and most effective skin care products. 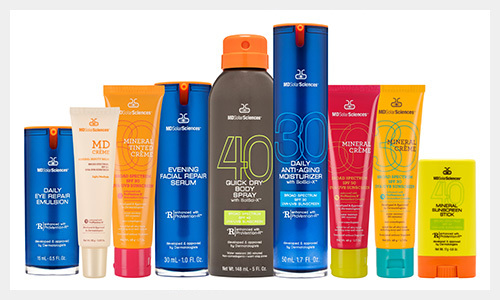 MD SolarSciences is an exceptional sun protection and skincare line. Their reef-friendly and Eco-cert sunscreens are not only highly effective at protecting your skin while you are out enjoying the summertime sunshine, they are also non-irritating, oil-free, and actually moisturizing. There is even a tinted mineral sun cream that makes your skin look flawless and silky; this is an excellent everyday sunscreen that might be all you really need to put on your face. We also carry Colorscience, which is another mineral based sun protection and skincare company. You might be amazed to learn that their Sunforgettable brush on mineral powder sunscreen contains SPF 50 and is incrediblly water-resistant. InStyle magazine rated this product a 2017 Best Beauty Buy. In a world of choices, why wouldn’t you choose a sun protectant that is environmentally and reef-friendly, all skin types and child-friendly, and not tested on animals that also protects your skin against the harsh and damaging rays of the sun and makes your face look flawlessly fabulous? Talk to Honi or Ivonne next time you are in for a visit to learn more about these fantastic summertime products.